Anthropology fields are: Socio-cultural, Linguistics, Physical anthropology, and Archaeology. Archaeology is the study of anthropology in the past. To a great extent archaeology depends on cultural remains. The American Southwest cultural area defined: From Durango Mexico to Durango, Colorado and from Las Vegas, Nevada to Las Vegas, New Mexico. All of Arizona, Southern Utah and Colorado, and most of New Mexico. Distinguishing features are diverse topography, aridity, simple technology. Geographic/Cultural subdivisions are Puebloan, Rancherias and Athapaskans. Athapaskans arrived about 500 years B.P. Pueblos have multiple languages and ethnic groups. Pueblo means "village." 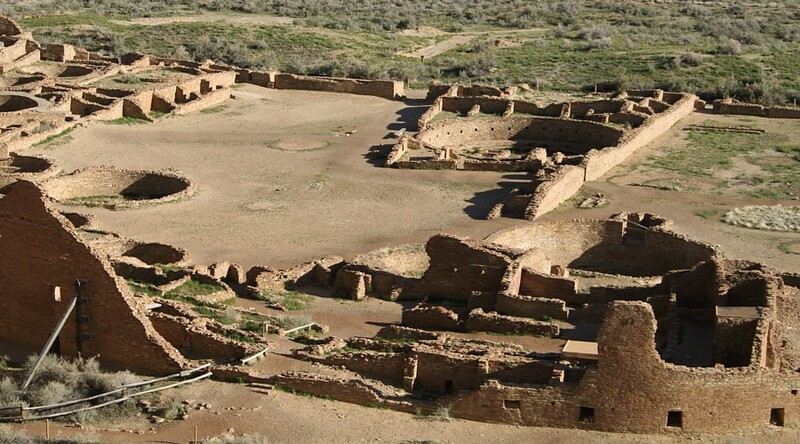 The pueblos are the oldest continuously inhabited settlements in the United States. 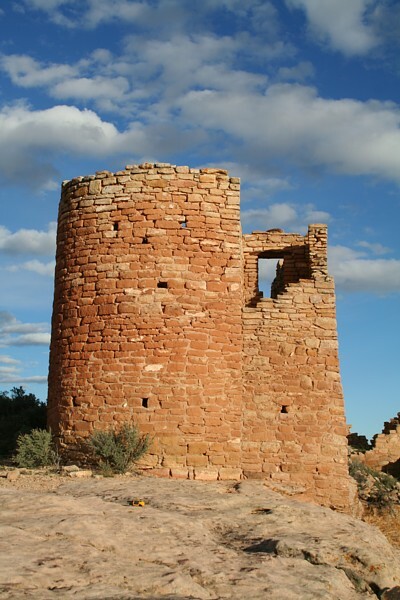 Western Pueblos are the Hopi and the Zuni. The majority, the Eastern Pueblos, are in the Rio Grande Valley. Prehistoric Puebloans were agriculturalists and hunters and gathers. Eastern Pueblos do irrigation. Unifying features of Puebloans are clan organization, adult initiation into societies, shared world view with this as the fourth world, sipapu is the place of emergence from the underworld, ritual structures called kivas have a sipapu. Katchinas in one conception are seen as ancestral spirits that bring rain. Katchina dances encourage the katchinas to arrive, ceremonies conducted in kivas and plazas. Rancherias are a dispersed settlement pattern over several miles instead of a concentrated village. Many ethnic groups are included in the rancheria area. These include the Pima, Tohono O'odham and related languages. One Pima group is the Gila River Reservation. Pima lived on or around major rivers and were sedentary, 60% farming dependent, using tepary, beans, squash and corn. Tohono O'odham migrated with the seasons using two settlements and were 25% farming dependent. Both organized into local groups and these groups endured for centuries, surviving longer than the actual villages. Use of material culture to gather information. Context provides the basis for understanding items. Excavation is destructive, therefore the archaeologist has a responsibility to preserve material, collect data and record findings. Research design: 1. Pose a significant question, 2. Plan how to answer the question, 3. Design a research strategy to gather evidence sought, 4. gather the evidence, excavate, do laboratory work and write the results. Dividing up the Southwest. In Social Sciences we need categories/systematics. Major SW areas are: Puebloan, Mogollon, Hohokam. These are archaeological names, not actual ancient cultures. Red-on-Bluff People was an early category for the Hohokam. 1539 Fray Marcos de Niza visits Zuni. This is the first recorded contact. 1540 Coronado expedition reached Zuni, the Tiwa pueblos. First written history in the Southwest. 1800's Euroamericans question who the Indians are. Evidence of civilization prompted assumptions of help from other "civilizations." Richard Wetherill discovers cliff dweller sites like Mesa Verde. John Wesley Powell, Smithsonian Bureau of American Ethnology, begins salvage archaeology, collection as much information as possible. Stevenson Expedition to Zuni in 1897 collected information and objects, wrote an encyclopedic volume. For the first time data was collected with objects. Frank Hamilton Cushing, part of the Stevenson Expedition, lived at Zuni, went native and was adopted into a Zuni society, spoke their language. Adolph Bandolier was in Cochiti in 1880. Studied and mapped ruins, including Pueblo Grande. Systematic data collection begins and classification schemes are proposed. 1926 - Folsom site is discovered. Points in an extinct bison altered the temporal paradigm. Kroeber and Spier (1916 - 1917) developed the seriation method based on pottery remains. A. V. Kidder, the first ever Ph. D. in archaeology, (1915 - 1929) conducted the first stratigraphic excavations of middens at Pecos Pueblo. 1927 - Kidder organized the Pecos Conference. Basketmaker and Pueblo periods defined by the Pecos Classification. 1915 - Department of Anthropology at University of Arizona. Arizona State Museum founded. 1937 - Douglass founds the Laboratory of Tree Ring Research at U of A. 1928 - Museum of Northern Arizona founded. Louis Binford wanted archaeologists to develop general laws of cultural processes. He saw the SW as a vast natural laboratory. 1974 - Archaeological Resource Protection Act passed. Some large projects have been Roosevelt, Black Mesa. Caused a large change in what is studied and provided a great increase in the financial expenditures on archaeology. 1990 - NAGPRA - cultural affiliation rights, agencies had to list items held, tribes could make claim, scientific and humanistic evidence valid. Key factors are rainfall, temperature, number of frost free days, farmland availability, water sources, floodwater. Plant categories: wild and domesticated. Domesticated plants appear in the SW by 1500 B.C. Domesticated are genetically altered and dependent, to some extent, on human propagation. Cultivated are the same genetically as wild, tough planted and cared for by humans. Agave. Hohokam Region: Sonoran advantage- lush desert with wild food plants year around; spring wild barley, agave, cholla buds -- summer saguaro fruits -- fall and winter mesquite, acorns, prickly pear. Cultigens are agave. Farming of corn, various beans, squash, gourds, supported by large-scale irrigation on flood plains. Fauna of rabbits and fish, small game. Mogollon Region: Forests rich in plants but not in human foods, diverse wild resources are cacti, mesquite, piñon, acorns, but not abundant. Farming of small patches of arable land by rainfall and floodwater farming. Mimbres used floodplain irrigation. Weather often not ideal, wet and cool or warm and dry. Population smaller than Pueblo or Hohokam areas. Pueblo Region: Less diverse wild resources, arable land varies by area with growing season problems in some areas. Farming was by floodwater, rainfall and irrigation in some areas. Paleo Indian Culture -- 11,500 - 8,000 BP poorly dated tentative epoch. Monte Verde, Chile, 13,400 BP row houses with numerous remains, Channel Islands, 13,000 BP skeleton, Meadowcroft, PA, 14,000 - 17,000? BP, Tlapacoya Island, MX, 24,000 BP hearth. Archaic Period -- 8,000 - 1,800 BP. Altitherm was 7,000 - 4,500 BP. More regionalism of cultures with diverse projectile point traditions, side-notched, corner-notched, and barbed points, evidence varying hunting strategies. Broad spectrum adaptation to small game and plant resources, esp. rabbits and seeds. Technology includes digging sticks, serrated stone, ground stones, manos and metates, storage baskets. Yields fruit 3k - 9k cal/hr, nuts 1k - 2k cal/hr, seeds 200 - 600 cal/hr. Tome and space scheduling requires intense knowledge of landscape. Residential and logistical mobility. Milagro 2780 BP, Sonoran Desert near Tucson associated with pithouses. Early domesticates spread quickly. Late Archaic (1500 - 200 BC) had corn, gourds and squash, associated with pithouses. Earliest sedentary farmers are in the Sonoran Desert. Slow change to sedentism is attributed to cultural evolution and genetic evolution. Sedentism = living year around in one place. Basketmaker II -- 200 BC - 500 AD, major changes. Pithouses associated with residential seasonal mobility, multi-year use. Multi-year middens, more burials. Basketmaker III -- 500 - 700 AD. Beans and pottery, bow and arrow, smaller points indicate new adaptations. Pottery = less mobility. Beans (lysine) = complete protein. Pottery used to cook beans = maximized caloric return. More storage pits and cists. Pithouses more substantial and great kivas appear. -Shabik'aschee had a communal economy: 70 small, standardized pit houses with small antechambers suitable for two persons, 47 cists, few storage pits in houses, large great kiva, storage and caching visible to community, burials outside pithouses. -SU site had a household based economy: 35 large, variably sized, larger antechambered pit houses, one large pithouse, storage inside homes and less visible, diverse burials. Pottery is ceramic, a chemical compound incorporating metal and non-metals. Earthenware is low temperature fired and porous. Stoneware is high fired and non-porous. Porcelain is vitrified (glass) and translucent. In the Upper Paleolithic in the Old World ceramic figurines occur around 13,000 BP Jomon pottery (in Japan) occurs between 10,000 and 5500 BC. Hohokam around 200 AD. Components are basic materials, clay, temper to stop cracking, increase thermal shock resistance, increase porosity. Temper is useful to archaeologists in identifying provenience of ware. 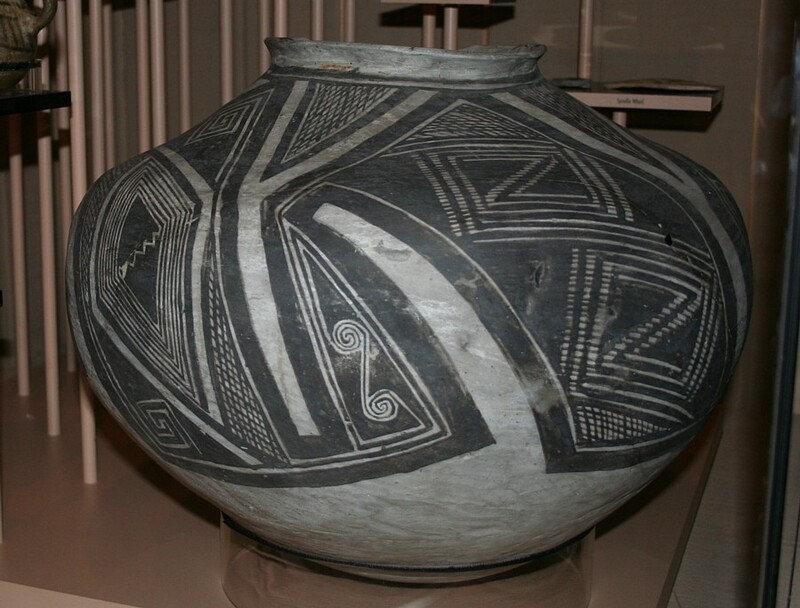 Forming of pots is a culturally identifiable process. Mogollon and Pueblo pots are coiled and scraped. Hohokam and Sinagua coiled and formed on a anvil using a paddle. SW pots are made without molds and without throwing. Decoration included polish, slip, paint, appliqué, or corrugated. Firing was done in the open or in lined pits, using wasters as cover. Pueblo I -- 700 - 900 AD. Year round occupation in pueblos with above ground rooms, some pit houses, pit structures have some ritual features. Typical site a double row of rooms fronted by pit structures, winter use of pits. Structures are warm and cold adapted. Living rooms have storage rooms attached. Household based economies and less sharing. Field houses indicate claim to land areas. Plant remains support continuous, year round occupation. Painted pottery, both black and white, and red. Duckfoot, a hamlet, relative dating based on bonding and abutting of construction. McPhee village has 21 room blocks and a remote kiva. 800 AD 2 great kivas 22.5 m in diameter. 840 - 900 AD oversized pit structures - 5 m - central in room blocks with elaborate sipapus and footdrums. Late 800's abandonment with pit structures burned, burying bodies in the floor. Pueblo II -- 900 - 1100 AD. Dominated by Chaco Canyon. First large scale stone ruins in the US. 850 Pueblo Bonito Phase, 900 irrigation agriculture, 1150 Great Kiva phase. Chaco Era 850 - 1150. Chaco sequence begins around 850 at confluence of drainages with good access to water and agriculture sites. 1000 - 1100 major population growth, Chaco considered a major regional center by 1050. 1075 - 1115 major construction peak. 1088-1092 Beams brought from 50 miles distance. 1100's experience environmental changes. 1130 - 1180 was a period of reduced rainfall. Around 1140 to 1150 Chaco became depopulated. Aztec Ruin takes place of Chaco. Chaco population estimated at 1500 - 5000. Given room with hearth is a habitation = six people, therefore 1500 - 2000 people. Given a room suite = six people 1500 - 2000, with Bonito at only 150 residents. Lots of non-habitation architecture, with a chain of storage rooms at Pueblo Bonito, and rooms deep within structure. Road related rooms at Pueblo Alto. 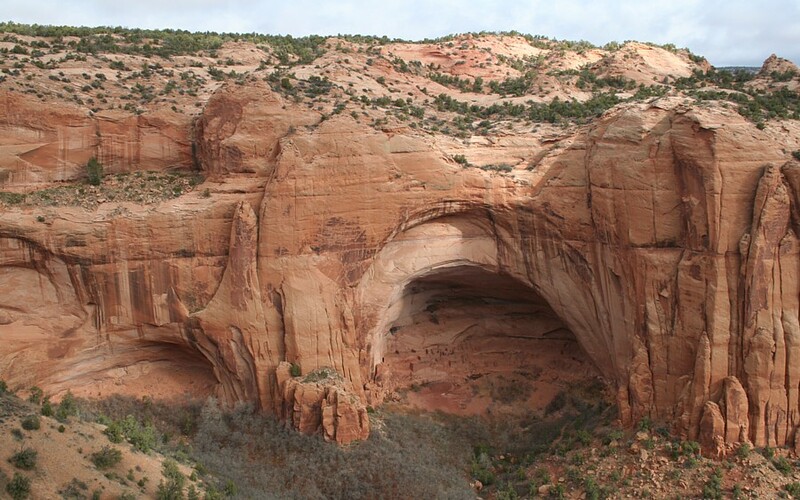 Architecture: Room average is 44 tons of sandstone, 50 million pieces in Chetro Ketl. To construct all the great houses 200,000 trees were used. Bonito had 4-5 stories and 600 or more rooms. Over engineering meant easy upkeep, inference of cultural importance. Estimate of a stage of construction was 30 people x 2 - 4 months a year for 10 years. Great houses built in stages. 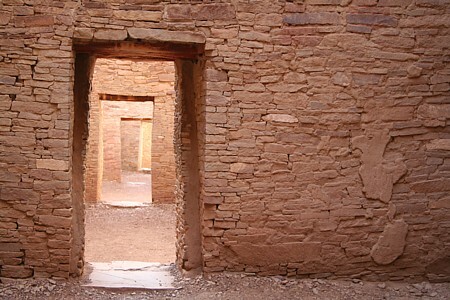 Chaco kivas can be above ground and surrounded by rectangular walls. Cribbed roofs. Great kivas are 15 - 20 meters in diameter. Casa Rinconada 63 feet. Pueblo Alto is one story 85 rooms with a big plaza. 1020 - 1060 construction, maintained until 1100. Only 5 household suites, these are heavily worn. Big room suites are not heavily worn and have a kiva. Trash midden is 2400 m3 with 150,000 pots, evidencing feasting. Status is evidenced at Chaco. A few burials are very rich, elaborate and early in the sequence. Little evidence of private wealth and residential evidence is of equality. Chaco health is better than at small sites. Acquired status likelier than stratification of the society. The Chaco System: Chaco regional system of about 100 sites in an area of 100,000 km2. Outliers have some Chacoan characteristics: multistory structures (great houses) great kivas, raised, enclosed kivas. Roads estimate is 2400 km.+ symbolic link roads point to Chaco. 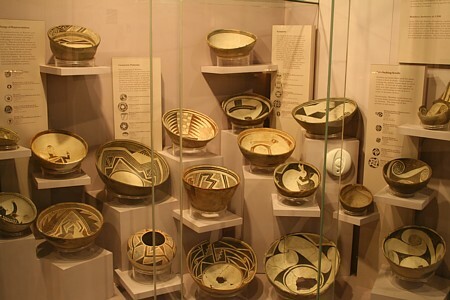 Imports to Chaco are pottery, 50% in 1000's and 95% in 1120. Shell, turquoise and deer imported. Processed turquoise exported. Roads are carefully engineered and flanked by berms of adobe, stone or earth, often connecting the great houses. Pottery: Cylinder vessels found exclusively at Chaco great houses, black on white painted vessel. Turquoise trade in evidence, processed turquoise items. Organization. Chaco Canyon is seen as a center for the regional system. The number of storage rooms may have been for redistribution purposes. The sites with outlier great houses are seen as part of the regional system. These populations utilized the canyon sites for gatherings. The center may also have served as a trade center. Roads often connected the sites. The region was tied together around Chaco Canyon. With Chaco Canyon acting as a ritual center and trade center. The low number of residents in Chaco Canyon would indicate that the visitors to the canyon came from the outliers. 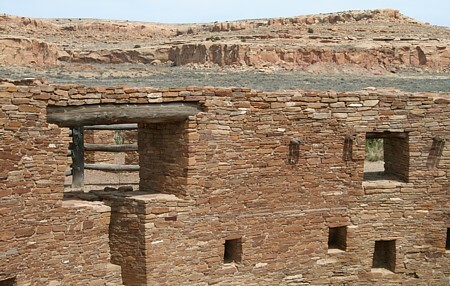 Archaeologists see evidence for a direct relationship with Chaco Canyon culture through the over-engineered architecture; the core and veneer walls; great round kivas surrounded by a square wall; like design and technology in pottery styles; multi-story structures; an inordinate number of non-habitation rooms; and often these outliers were connected by the Chaco roads. Chacoan Great Houses identified by: --core and veneer masonry, over engineered walls; round kivas w/square outside walls built above ground; lot of extra non-habitation rooms, multistory, plazas part of pueblo layout, often a great kiva incorporated, roads to/from Chaco --large quantities of pottery from the Chuska Mountains to the west; turquoise found at outliers same as found in Chaco, traceable roads connecting outliers and Chaco. Casa Riconada, with Chetro Ketl in the background. Mesa Verde (4-Corners, San Juan) Region. History: 1888 Richard Wetherill finds Cliff Palace, 200 rooms, 8 kivas and 8 levels, turkey pens. Mesa Verde had largest aggregation in SW after 1150. 1889-1900 1000 visitors, instant fame, Wetherills began trading antiquities. 1893 Nordenskiold "The Cliff Dwellers of Mesa Verde," excavated in Mug House and Spruce Tree House. Mesa Verde Sequence: Mesa top habitation on Chapin and Wetherill Mesas. 36 sites with 200 - 400 people AD 1000 - 1200. Tower construction. Mummy Lake Reservoir held 500,000 gallons. 1200 AD shift to canyon occupation with greater aggregations. Fewkes Canyon had 33 sites with 530 rooms, 600 - 800 people, Sun Temple, Cliff Palace and Spruce Tree House built. Sun Temple has bi-walled construction. Montezuma Valley: 10,000 - 30,000 people doing Mesa Top dry land farming. 1000 - 1150 population dispersed. 1200 population aggregated into 8+ towns, some with history and some new. Important communities established by 1000 with community stability and mobile people. Pre-1150 household occupations 15 - 25 years, post 1150 - 1250 25 - 50 years. Evidence of conflict onset around 1200, upon aggregation into towns. Standardized ceramic complex in the region with no imports. Isolation from the remainder of the SW. No imports in evidence by 1300. Sand Canyon Pueblo: 1250 - 1280, canyon rim site, east side residential and west side with kivas, unit pueblos, low encircling wall, use of boundary marking stones. Mesa Verde Region Abandonment Process. 10,000 - 30,000 people leave the region. People moved to the Rio Grande and Little Colorado River areas. 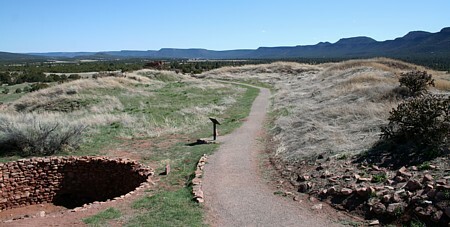 By 1200 more concentration into central Mesa Verde region with abandonment of small sites as people aggregated in towns. At Sand Canyon orderly abandonment evidenced. Units of movement parallel unit construction. Trash filled units indicate process over several years. Some units burned with contents, kivas burned. Abandonment causes. Migration is a normal event for SW populations. Great Drought from 1276 - 1299. 1275 tree ring dates, complete abandonment by 1300. Not the first drought event in the SW. Carrying capacity of the land. People were in circumscribed areas. No evidence of invading outsiders. Evidence of intra-regional conflict with some people getting killed at some sites. Attraction of the riverine sites. Irrigation terraces on the Little Colorado, reliable irrigation on the Rio Grande. 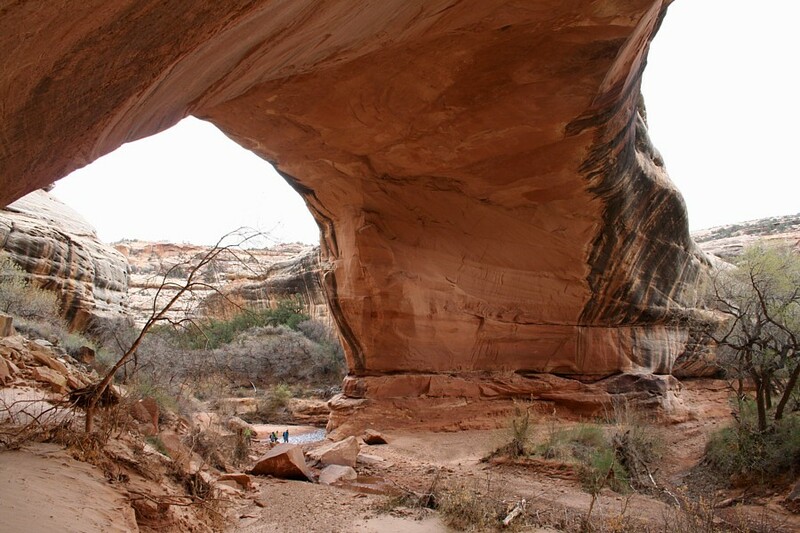 Kayenta Region: Black Mesa, Canyon de Chelly, Long Valley, Tsegi Canyon. No Chaco outliers during Pueblo II. Black Mesa empty by 1150. Tsegi Phase: 1250 Keet Seel founded, 1267 Betatakin founded. 1272 - 1276 population influx with new sites. 1280 population maximum. 1285 decline, 1300 deserted. Room cluster construction w/o kivas. Clusters of storage, living, granary and courtyard. Betatakin has 135 rooms, 2 kivas, homogeneous architecture built in 3 organized phases with pre-cut beams. Kite Seel has 155 rooms and 6 kivas with more variable construction and accretion of buildings. New organization evidenced with fewer kivas not linked to household units. Long House Valley had five clusters of sites with the focal site at the water source, 2 - 12 satellites. intervisibility of major sites may have been defensive. Pan SW processes and styles. Hohokam and pueblo distinction is blurred. Larger sites and clusters of sites with open regions between clusters. Plazas incorporated into pueblos with fewer kivas. Pueblo III had six rooms per kiva, Pueblo IV has 50 : 1 ratio and end of unit pueblos. Cotton is grown as a commodity. Conflict is evidenced. West pueblos are matrilineal descent groups with ritual societies that cross-cut descent groups, absence of architectural boundaries. Katchina iconography (Fourmile Style) appears. Southwest regional iconography on pottery, rock art and kiva murals; flowers, butterflies, serpents, parrots, masks. Homol'ovi III linear constructions, 40 rooms, 2 rectangular kivas, sandstone/adobe, Tusayan pottery. Homol'ovi IV terrace-like and masonry construction, 150 - 200 small rooms, White Mountain and Cibola pottery. 1300 AD river rises again and Homol'ovi III and Homol'ovi IV abandoned. Aggregation and mixing in the new Homol'ovi I and Homol'ovi II pueblos, with much larger, plaza-oriented sites, Katchina iconography, lots of cotton, Jeddito Yellow Pottery, Fourmile Style, shrines, field houses and territoriality marking. 1400 abandonment and move to Hopi villages. Architecture: PIII - self-contained unit pueblos with one kiva to every 6 rooms, great kivas, more dispersed on the landscape. PIV - no more unit pueblos, ratio of 50 rooms to a kiva, rooms in rows, larger planned construction events, plaza oriented sites, defensible building planning, much larger pueblos (5 - 10 times larger) and (discrete spatial clusters) open regions between concentrations of pueblos. Advent of the marking of land and territoriality. Interpretation: Conflicts and resource competition by larger populations resulted in aggregation of the population in defensible, larger communities. Plaza architecture is defensive. Discrete spatial clusters of pueblos are interpreted as evidence of distinct polities and hostility. Agriculture: PIII - Subsistence agriculture of corn, beans and squash. PIV - Introduction of cotton. Interpretation: Trade and exchange have gained in importance. PIII agriculture was almost exclusively food production. During PIV cotton becomes ubiquitous, new commodity production becomes new economic activity, producing possible wealth. Pottery, Art and Iconography. PIII - Regional styles in pottery, standardized ceramic complex with little importations, no katchinas. PIV - pan-SW processes and styles, Hohokam and Puebloan distinction is blurred. Advent of Katchinas, Four Mile horizon style with themes of fertility (flowers, butterflies, masks, serpents), terraces. Change in decorative patterns on painted ceramics. Interpretation: Time of change and/or turmoil, possible conflicts. Promotion of a sense of community. Social changes. PIII had clustering of regional pottery styles and minor exchange. PIV had pan-SW styles (Salado Polychrome) and high levels of trade, regional interaction among groups increased significantly. PIII architecture was unidirectional pueblos, small and lots of them. PIV used plazas, compounds, surrounding walls, larger clustered sites, implication is village aggregation to defensible locations infers conflict. There are several lines of evidence for conflict in the post-1300 northern Southwest. A variety of characteristics connect the prehistoric and present indigenous populations: contiguous architecture, kivas, maize, bean and squash agriculture and ritual beliefs and practices focused on katchinas. To date most studies have placed greater emphasis on the similarities of historic Pueblo culture and the late prehistoric. Abandonment of traditional territories and transformation of the social landscape contradicts the paradigm of substantial cultural continuity. Focus on the differences will allow a better understanding of the cultural changes. In order to understand modifications in village architecture the social context of the period must be examined more closely. The social context of the thirteenth to fifteenth century was characterized as much by conflict as by cooperation. Changing settlement size (communities five to ten times larger than late thirteenth century towns), the change from great kivas to plaza-oriented architecture and changes in decorative patterns on painted ceramics evidence social changes in the fourteenth century. Aggregation in the late thirteenth century is seen as due to defense and safety in numbers, with the threat of conflict continuing in the fourteenth century. Plaza architecture is interpreted as defensive. Discrete spatial clusters of pueblos are interpreted as evidence of distinct polities and hostility. A major indicator of conflict was the aggregation of small, unidirectionally designed pueblos into large, walled clusters with much greater distances separating the groups. The use of walled plazas itself as a defensive tactic was attested to by various Spanish explorers. Placing the clusters further apart reduced the competition for arable land. Distinguishing features include coiled and scraped pottery. Round, then square, pithouses with ramp entry. Ceremonial structures lack sipapus. --Early Pithouse: 200 - 550 AD. High ground, lots of wild foods. Pottery: brown, then red slip, then painted. --Late Pithouse: 550 - 1000 AD. Large sites near flood plains, more farming. Pottery: white slip, eventually B/W. --Classic: 1000 - 1130/50 AD. pueblos and irrigation. Pottery: elaborate B/W, naturalistic and abstract designs. Classic Period was one of intensive farming of corn, beans and squash, water control features, bordered fields with ditches and terraces, low tech and labor intensive. Mimbres area in 1100 AD had lots of riparian species and mesquite, and by 1150 mostly bushy plants. Trees had been cut. Villages of 50 - 200 rooms and field houses. Continuous occupation for hundreds of years. Clusters of rooms gradually expanded as population grows. Environmental degradation corresponds to growth. Organization: no apparent plan to villages, no hierarchy evidence, homogeneous architecture, rules of painting pottery. By 1150 the villages had been abandoned. Movement is an important aspect of desert adaptation. Residential stability results in local environment degradation. Non-sustainable. Postclassic: 1150 - 1250. Reorganization in Rio Grande drainages. Continuity evidence is remodeling and additions, ceramics - classic Mimbres pots in use, radiocarbon dating is flat. Also new social relationships in evidence: new pots, new ceramic ware types, up to 8 vs. one. New technology added to plainware evidences some immigrations. Comparison and contrast of the Mimbres Classic and Postclassic occupations. Pottery -- Classic; 1000-1150, elaborate black on white, naturalistic and abstract pattern, homogeneous style with apparent rules of painting. Iconographic conventions include many rabbits, sheep, copulation, unusual animals, humans, masks, mesoamerican themes and plumed serpents. -- Postclassic; 1150 -1250, Classic Mimbres pots in use in Postclassic. Mimbres iconography discontinued. New technology added to plainware. A diverse variety of pottery types associated with different areas of the Southwest at Postclassic hamlets. Classic Mimbres iconography is continued after 1150. Reserve-Tularosa technological style imported. Interpretation of the evidence: Ideology of conformity during the Classic. New technology indicates influx of some new people. Regional interaction increased post 1150 with greater social interaction and movement of people. Settlement patterns -- Classic; pueblos, villages of 50 to 200 rooms and field houses. Hundreds of years of continuous occupation. Autonomous clusters of rooms with no apparent plan to villages and an amorphous plaza. Homogeneous architecture. Environmental degradation evidenced by deforestation, firewood evidence. Concentrated population in the Mimbres Valley with field houses. AD 1000 lots of riparian species and mesquite, 1150 AD mostly bushy plants. -- Postclassic; villages abandoned or heavily depopulated. Change from villages to small hamlets, remodeling and additions to Classic period field houses with transformation of jacal into masonry. Radiocarbon dating supports continuous occupation. Mimbres style architecture continues. Interpretation of the evidence: -- Classic; clustering of rooms indicates gradual expansion of population. no evidence of hierarchy, residential stability, residential stability was a non-sustainable subsistence pattern. -- Postclassic; remodeling of field houses indicates continuity, Flat radiocarbon date indicate continuity. Agricultural practices -- Classic; irrigation systems were in use, water control features, bordered fields with ditched and terraces, low tech and labor intensive, intense farming of corn and beans. -- Postclassic; All hearths had cultigens, change from large scale irrigation systems to dispersed. Interpretation of the evidence: There was a degradation of the environment from long and continuous use. Cultigen evidence indicates same manner of subsistence, with change in areas farmed. General interpretation: Mimbres classical abandonment was actually a reorganization. Community and regional relations were redefined at a broader and less restrictive level. Mimbres Classic period was marked by aggregated villages with several hundred inhabitants. Postclassic saw population disbursement to small hamlets. Therefore, it would seem that Postclassic Mimbres are still cultivating at least as much as the Classic Mimbres. Discussion: Ways in which the focus, or scale of observation, affect our understanding of prehistoric 'abandonments' with reference to the Mimbres and Mesa Verde 'abandonments.' Focusing only on a small area may give the impression that a region has been abandoned. The Mimbres valley may have been abandoned, but the Mimbres region evidences continuity of occupation. In this case a regional view is adequate to assess what really occurred. 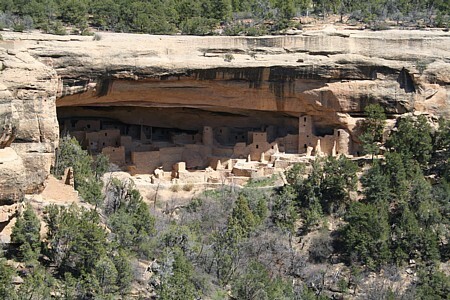 In the case of the Mesa Verde abandonment a much wider view is needed. The Mesa Verde populations did abandon the region and moved to the Rio Grande Valley, a movement of greater distance than the Mimbres. The Mesa Verde movement can be called an abandonment, the Mimbres is best viewed as a regional reorganization. A camera viewfinder is an excellent analogy because a number of push and pull factors may lead a population away from an area that they had historically occupied. In the camera example, a narrow focus of the camera would indicate that the area was abandoned and the inhabitants disappeared, when in fact they had just moved out of the view of the camera. In the case of the Mimbres, the population did not abandon the region, signaling the end of the Mimbres culture. Rather they disbursed to smaller hamlets to the east. If we do not expand our scale of observation it would be easy to assume that they had disappeared. The scale of observation needs to be larger for the Mesa Verde region. Its inhabitants moved all the way to the Rio Grande Valley 200 miles distant. Mimbre architecture: There are at least six different functional types of rooms, and the occurrence of these functional types depends on the size of the social group, and whether it is an extended family or corporate group. Features in rooms and the way they articulate with other rooms defines the room type. There is a great deal of variability in the use of building materials, depending on the location relative to the kind of available stone, and when the room was constructed. Great kivas during the pithouse-pueblo transition (A.D. 900-1000) had sipapus, and Classic corporate kivas had rectangular floor vaults placed next to the hearth. Mimbres mortuary practices: Intramural burials, which account for 85% of all Classic period burials, were lineage cemeteries placed beneath certain types of rooms. Extramural burials included inhumations (10%) and cremations (5%). Mimbres pottery: Style III painted pottery ceased to be produced probably before A.D.1150. Arguments for continued use after 1150, are based on radiocarbon dates. A microstylistic sequence worked out for Style III based on tree-ring dates indicates the rules of design began to break down after A.D. 1100. 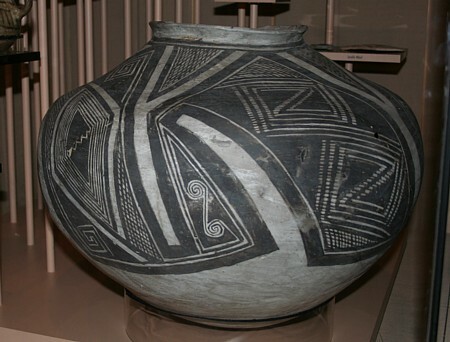 Style II and III were but one of a number of material correlates that relate to the organization of Mimbres society involved in irrigation agriculture. When the system broke down after A.D. 1130, the pottery ceased to be made but heirloom vessels may have been used up to mid century. 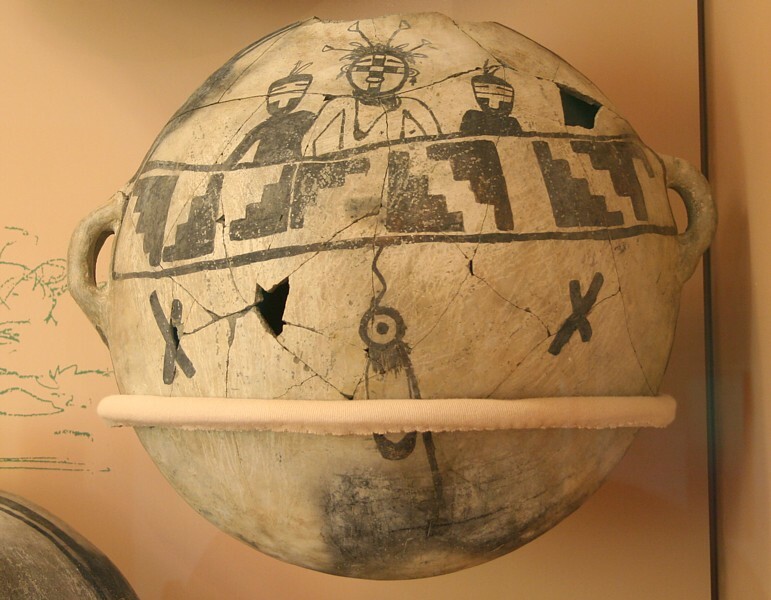 For more complete information and some excellent graphics visit Mimbres Archaeology. The Hohokam are multi-lingual and multi-ethnic; ancestral to O'odham and Yumans. 1400's population was 40,000 to 80,000. Spanish contact population was 5,000. Area is from Gulf of California to Flagstaff, core area was Gila-Salt confluence and adjacent valley areas. Traits: rancherias (houses in pits), irrigation agriculture with large scale canals, red on bluff, paddle and anvil pottery, naturalistic figures in the designs, cremation, links to Mesoamerica as evidenced by ballcourts and platform mounds, social hierarchy. Chronology: Origins show continuity from the Archaic or earlier, Dating difficult due to lack of dendrochronology, before 1980 less than 120 dates, now thousands. Preclassic: Pioneer -- 300 BC - AD 500. Colonial -- 500 - 875. Sedentary -- 875 - 1100/1150. Classic: 1150 - 1450. Subsistence: Flowing rivers and Sonoran abundance. Farming included floodplain, ak-chin, dry terraces, canals. Canal irrigation by the end of the Pioneer period included the main canals and laterals totaling 500+ miles, farming 25,000 acres. Canals were up to 50 - 75 feet wide. Method is risky, expensive and highly productive, and requires organization of labor. Silting evidenced at La Ciudad. Soils salinization evidenced. Floods damaged the system. Disease vectors increase. Architecture: Pit houses had risers in early Pioneer period, evidencing in-house storage. Risers decline with advent of courtyard groups. Courtyard groups occupied 40 - 100 years. Ballcourt from Tucson area to Flagstaff, with 225 ballcourts at 160 larger sites. Oval, elliptical in form with berms. Trade: Regional exchange network larger than ballcourt area. Gulf of California shell homogeneous distribution, copper bells and exotic stone from Mexico, obsidian from Gila Bend area, forest products and stone from the north. Valley had a surplus of agricultural product. Temporal Changes: Adobe compounds replace pit houses during Classic. Hohokam redware changes from Gila Red (to 1300) to Salt Red evidencing change in exchange. During the Classic platform mounds replace ballcourts and are concentrated. One mound replaces several ballcourts, indication of social reorganization. 1250 AD residences atop mounds. 1300 Salado polychromes imported and increase of activity in the Tonto Basin. Inhumation increases. New iconography. Canals and Social Organization: Canals require headgates, specific gradients, cannot cross waterways. Management is necessary. Hohokam system increased in complexity over time. No evidence of violence indicates social stability. Largest sites at the headwater of the canal. Often one major platform mound near the headwater of the canal. The larger upstream canals lasted longer. Steeper gradients in the Classic may indicate water competition. Hierarchy: Greatest evidence of hierarchy in the SW. Few Great Houses and limited number of mounds indicates regional organization. Special houses and goods found atop mounds. Walled compounds around mounds and Great Houses. More adobe compounds near mounds with courtyard groups ion mound periphery. Roosevelt Platform Mound Study: Unlike Phoenix, area has more intact archaeology. Mounds had no cooking pots. In 1280 rooms infilled and new story added. No hearths in rooms and little food refuse. Platform mounds had ceremonial rooms, with some rooms around the mound having hearths. Rare objects, crystals, stone balls, shell trumpets. Gila Polychrome era 1320 AD: Cline Terrace: 2-3 m. high mounds, 2 m. wide surrounding compound wall. A dozen ceremonial rooms, lesser surrounding sites w/o central economic focus. Turquoise evenly distributed. Dentition study indicates close relationship of Phoenix populations to Tonto Basin settlers. Tonto Basin had a dozen platform mounds and hundreds of villages. Comparison: Pre-Classic Hohokam ballcourts and Classic platform mounds. - ballcourts are oval or elliptical form depressions surrounded by berms. --platform mounds are concentrated, within 60 miles of Snaketown (Lower Gila River), there are fewer mounds than ballcourts. - mounds had courtyards and enclosure walls. These may have served to limit access. Hohokam chronology depends on ceramics variation. Classic period red-slipped ware makes up 10 to 30 percent of Hohokam ceramics between A.D. 100 and 1450. These have been the basis of site dating. Schroeder divided redware into Gila and Salt, and he designated Gila Red as the temporal diagnostic for the first part of the Classic and Salt Red was assigned to the later Civano phase. In Schroeder's model one type replaced another throughout the Phoenix basin. Later authors divide the ware into four types and retained the model of change in the creation of ceramics by a unified pottery tradition over time. The excavation of parts of Pueblo Grande changed this view. The temporal trends previously noted and assumed to be temporal trends over time were shown to be production differences across space. The regional scale analysis that was performed in conjunction with the large Pueblo Grande excavation included petrographic analysis. Close association between clay and temper types was proven. Hohokam potters relied on materials closest at hand, therefore temper is an excellent indicator of production areas. Sand types have determined six production zones in the Phoenix Basin. At Pueblo Grande 3,300 redware sherds were identified by temper type. The results indicate the degree to which Hohokam villages relied on other villages for red ware. The change in red ware is a change in sources of an imported commodity, not a temporal variation in how potters produced local ware. The variation at work is the way populations in the region interacted with each other. Widespread patterns of exchange and interaction are in evidence. -- Agriculture: The Hohokam relied on a river source irrigation system and an extensive system of canals. The Chacoans relied on rainfall and collecting runoff for irrigation. Both cultures used irrigation systems to facilitate agriculture. The Hohokam used massive irrigation canals to bring water to their large fields. This resulted in significant surpluses. The Chacoans used check dams and diversion/collection systems but were reliant on water pouring into the canyon from the rim after thunderstorms. The perennial water advantage of the Hohokam allowed the population to grow significantly. -- Social Organization: The Chacoan system had a concentrated central system of great houses. The Hohokam had dispersed platform mounds. Both the Chacoans and the Hohokam evidence some hierarchy or at least high status individuals. Elite burials are found in Chaco Canyon and cylinder mugs are only found in association with the canyon great houses. 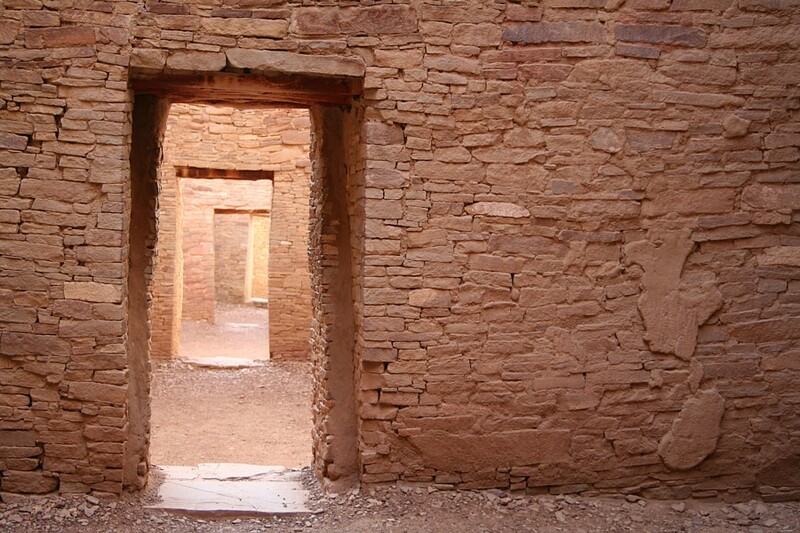 The burials in association with the canyon great houses were in better health than the average Puebloan. The Hohokam hierarchy is evidenced by limited access to the platform mounds and residences on the mounds after 1250. Hohokam distribution of shell artifacts was homogeneous throughout the ballcourt region. In Chaco the majority of shell seems to be found in Chaco canyon, as imports from the outliers. Chaco system had a less even balance of precious goods. These notes are my writing, and were taken during an undergraduate course in Southwest Archaeology at Arizona State University taught by Dr. Michele Hegmon. I am solely responsible for the transcription.